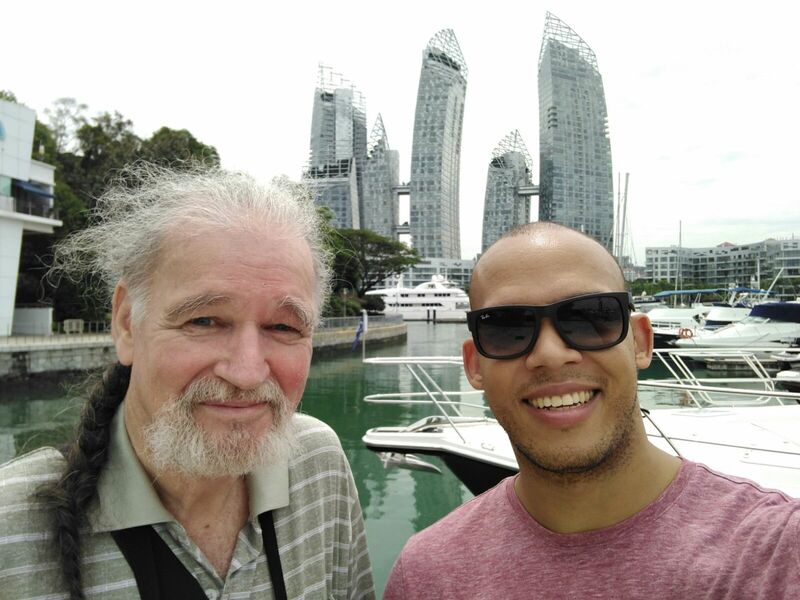 I spent last week in Singapore, visiting my son Tom. 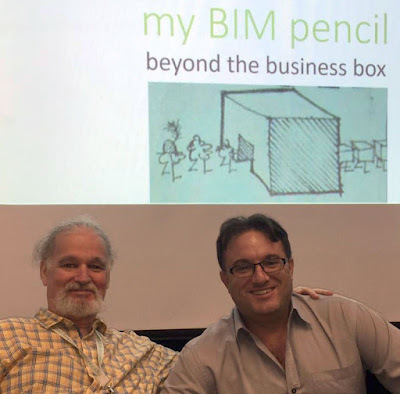 While I was there I hooked up with the BIM Troublemaker aka Phil Lazarus, who kindly arranged for me to give a talk to a group of enthusiastic young reviteers. That was the final evening of my short stay and provided a suitable climax. The venue was Autodesk Singapore, who have offices at Fusionopolis, a fairly new office park location that I happened to have visited earlier that same day, because my son also works in the area. This post is just a quick travelogue. I will package up the talk I gave when I get a chance, and also probably post at more length about Singapore, but I wanted to get something out quickly. I had arrived on friday afternoon and that night, Tom took me down to see the "supertrees". We had a drink at the top of one of these which gave a splendid view of Marina Bay Sands and the city beyond. The supertrees themselves have all kinds of pseudobiological functions as well as performing light shows. They sit partly above a biomass energy plant. Singapore has an impressive sustainability strategy, recycling as much waste as it can, burning the rest, and using the resulting ash as land-fill, creating new islands and extensions to the southern coastline. Next day Tom wasn't too well, so I went in to town on my own. He gave me a plan that took me through China Town. So much here that I would like to tackle with my BIM Pencil. The elaborate structural timber of chinese temple roofs have been at the back of my mind for many years. Not too hard to model in Revit I think, and you would surely gain a much deeper understanding of how they work in the process. I love the abstraction of chinese lions, especially the vaguely cubist ones in front of the old Bank of China. These would be quite challenging to model natively with Revit and I'm not sure you would learn anything very useful in the process. Perhaps I should have taken more pictures and attempted some photogrammetry. But I really fell in love with the Shophouses. There would certainly be a great deal to learn by modelling these, and they are eminently well suited to standard BIM modelling techniques. They seem to be a regional form arising out of a fusion of cultures along a coastline with a rich history of long-distance trade and commerce. (Penang, Malacca, Kuching) The windows with their shutters and railings remind me of the ones I saw in Kathmandu, another densely populated ancient trading centre. This was my second visit to Singapore. I spent a single day there 19 years ago, gathering ideas for a project I was embarking on in Harare at that time, when Zimbabwe was still infused with optimism. I remembered the shophouses along the Boat Quay, which were beginning to be renovated at that time. Along the river front they were looking very spick and span, but around the back, less so. I was struck by an art-deco building here standing at an acute corner, like the flat-iron building in New York. It's been spruced up now of course. Just across the river is the Civic Centre, with some very grand classical buildings from the colonial era, overshadowed now by skyscrapers. Another thing I remembered from 1997 was watching cricket in a central green space, like an English village green, inflated in size and transported to the far east. Next day Tom felt well enough to take me around the area where he does his long-distance running. As it happens he lives very close to a development called Reflections at Keppel Bay, by Daniel Liebeskind, who I have to say is not my favourite architect. Without wishing to be rude, I find his work just a shade on the pretentious side. Afer lunch we took a cab to Sentosa, an island theme park which contains one of Singapore's Merlion sculptures. I don't think there's any connection, but these are also shaped a little like the dragon's tooth. The Merlion is a modern invention, a tourism mascot from the 1970s I think. This one stands on a hilltop, and close by is a cable car ride with splendid views of the port, whose cranes rather remind me of giraffes. The cable ride takes you to the top of Mt Faber, which is a wonderful rain-forest park. From here we walked down to Tom's condo, taking a slight detour to check out Henderson Waves, a pedestrian bridge that forms part of a nature trail across the Southern ridges. This is a splendid structure: beautiful, organic, practical and structurally elegant. Look it up. Next day I went in to town on my own again. I wanted to photograph the old Raffles Hotel, a building reminiscent of the Victoria Falls Hotel which I got to know ver some 20 years ago, as project architect for its refurbishment. There is something special about these grand old colonial hotels with their courtyards, open walkways and classical detailing. What projects they would make to model in Revit. All my work for VFH was done very simply in 2d using AutoCAD, but I was rather proud of it at the time. I walked on to the Cathedral & then the Peranakan Museum. All very interesting but I need to skip forward. I continued past the Fire Station, the Police Station and Clarke Quays (yuk) until I stumbled across the Parkroyal on Pickering, one of many Singapore buildings with skygardens. What particularly impressed me though was the way the lower storeys were handled, with GRC mouldings, ("sweeps" in Revit terms), emulating rock strata. Proceeding through China Town, I ended up at the Urban Redevelopment Authority where there is a splendid "City Museum" which seems to be very effective at engaging the citizenry in the planning process. There are two very large models on display: one of the whole island and the other of the central areas of the city. Lots of other interesting exhibits too and it was full of enthusiastic young visitors chattering away. So I was very impressed with Singapore, and intrigued by the comparison with Dubai: lots of similarities and lots of differences. I shall be reflecting on that for many weeks to come. Perhaps the most striking difference was the ease of interacting with young local people. In Dubai I meet lots of creative young people, but they are mostly expatriates and the few local people I come into contact with tend to be somewhat older. But let's finish with the shophouse typology. Itis a very resilient and adaptable tradition, as you might expect a "mongrel" to be. From nineteenth century classical revival to 1930s art deco and beyond it has survived and reinvented itself. Perhaps the vogue for converting old shophouses to new uses has diverted attention from the need to explore a 21st century version of this form. Perhaps they exist, but I can't remember seeing them. Could the multi-storey, mixed-use developments with their sky-gardens also incorporate an ultramodern version of the shohhouse threading through the development at ground floor level? Is there a high tech equivalent of those multi-layered windows with their shutters and railings? Could we take inspiration from the way the rows of similar but individual units snake along the ground like the trunk of a Chinese dragon ... regularity and diversity wrapped up in the same package? I wonder. John Soane was a collector. His Dulwich Picture Gallery is arguably the first such institution aimed at the general public. He built a museum around himself collecting everything from the contemporary social commentary of Hogarth to an Egyptian sarcophagus. He was part of a group that pioneered the idea of freeze-drying history, preserving, dissecting, framing and mounting. It seems a commonplace to us. We now capture and share the most banal personal moments and embalm them in digital databases. 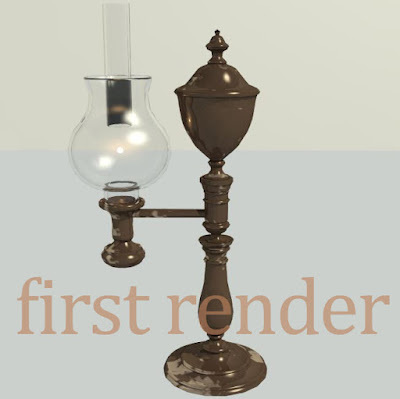 What is a rendered image? The Building Information Models that I spend much of my time constructing and navigating are living, breathing things: tools for thinking with, records of human interaction. A screenshot from Revit captures the transient nature of this process, hints at the blundering activity that we call design. But clients now demand photo-realistic rendering at every stage of a project. 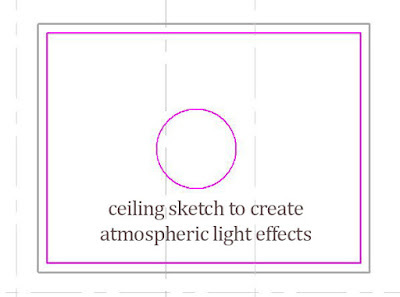 In a way these are much more dynamic and emotive than the crude axonometric world that we inhabit while we work. But on another level, they are stiff and frozen, products of many man-hours spent arranging a single, carefully composed view. They are stage-managed and window-dressed, but deliberately contrived to look like casual snapshots of the real world. This week I decided to model a strange little item from the Bank Stock Office. I based my work on a fake. 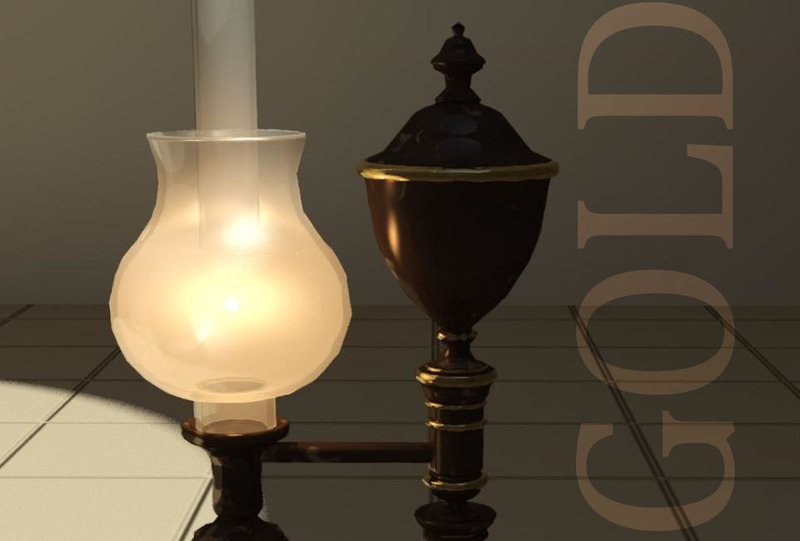 It's a very nice fake, but it's an electric lamp that imitates an oil lamp, and it lives in a museum that pretends to be a banking hall. This room inhabits the same physical space as the Bank Stock Office (almost, it's been raised 3 steps higher) but it's a reconstruction. Don't get me wrong. It's a wonderful place, and I'm glad it's there, but we need to be aware of the distortions that occur when we fossilise things. 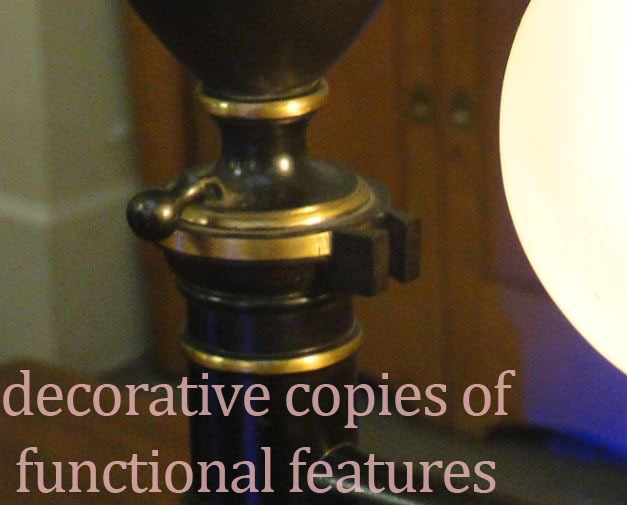 This screenshot from Family Editor shows a picture that I took of the fake lamp, with a series of revolves in wireframe mode over the top. 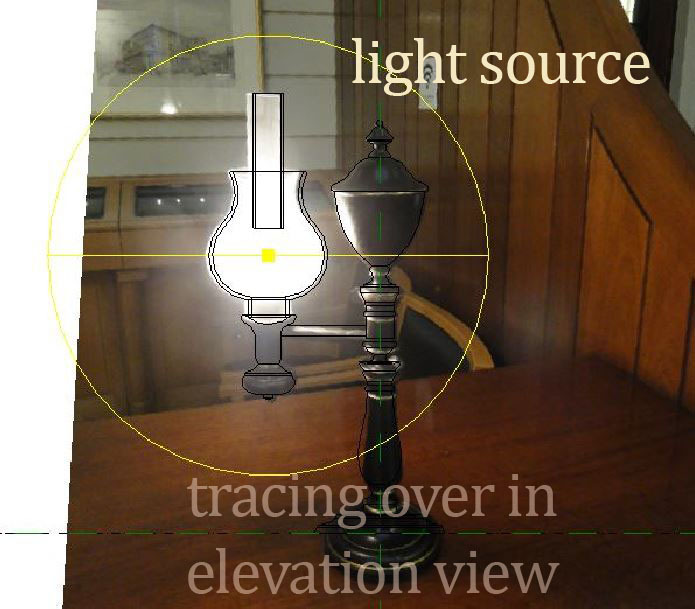 Then there's a light source (not a real one, a digital fake) That's a front elevation, as you can tell from the reference planes. A 3d view shows the 4 revolves more clearly. I'm guessing that the urn-like shape is a reservoir for oil (whale oil?) with a lid for topping it up. 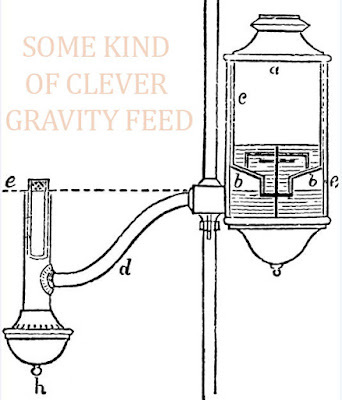 Gravity feed seems like a good idea, but how do you stop the oil from just draining away? In a way it reminds me of a chess piece, the Red Queen perhaps, holding a lamp in her outstretched arm. I suppose there is some merit in not having the flame directly above the reservoir as is the case with many lamps. You see what's going on here. 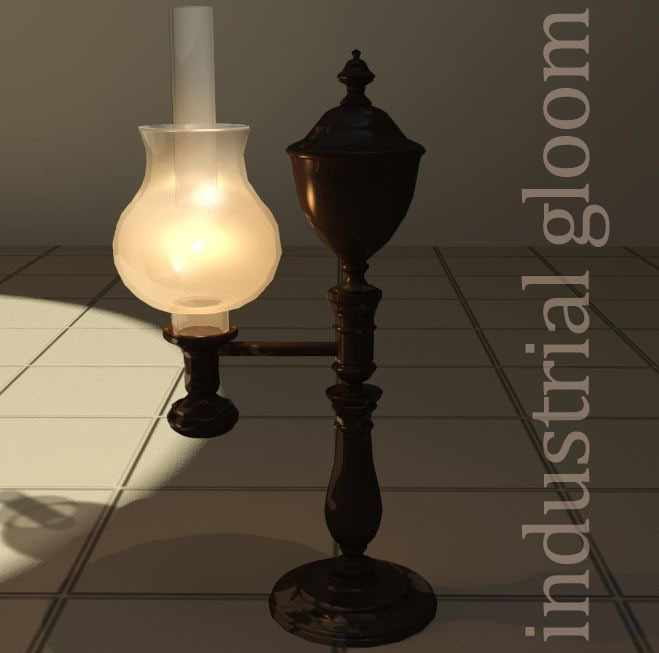 On one hand I'm concerned with creating an image: playing with the material parameters, adjusting the lighting effects. 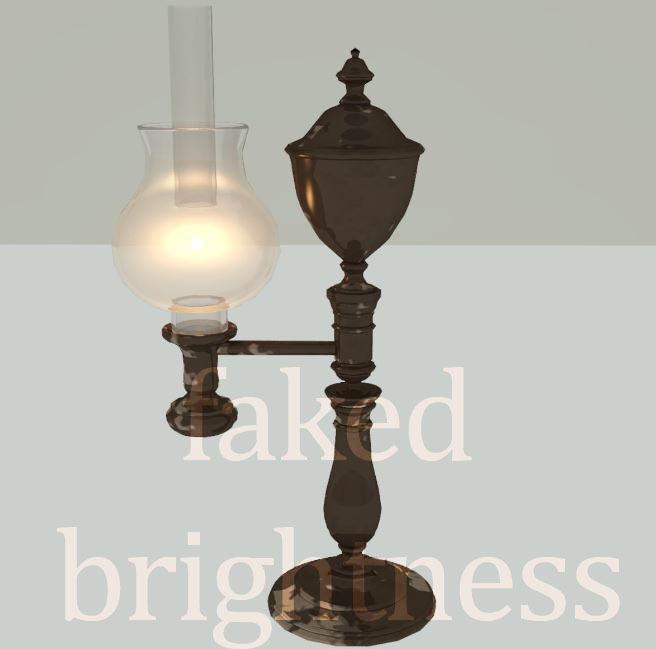 Cranking up the lumens of the artificial light source so that it becomes visible in the render, giving the glass a self-luminance value so that it looks opal, like the one in the museum. But in the back of my mind I keep wondering how it works, what the historical significance is, why I am actually doing all this. There is a tension between the "fake-ness" of the whole museum-collector thing, and the hunger for knowledge that motivates it. How was the lamp made, I wonder. 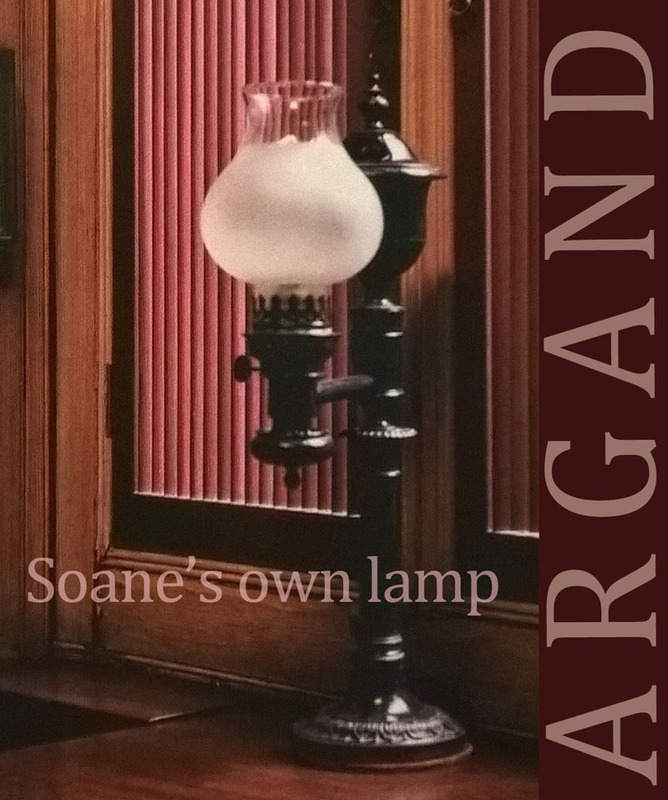 Soane was working at the dawn of the industrial age. Mass production was about to obliterate the traditional craft processes that generated elegant forms. The generation after Soane would agonise about this (William Morris etc) Clearly these shapes are inspired by the wood-turning lathe, and more distantly the potter's wheel. Ironically, the current fakes may actually be made this way. I never touched them to check whether they are metal. But as I started to render the images it became clear that the delicate, gilded lines that catch the highlights so well are very important. 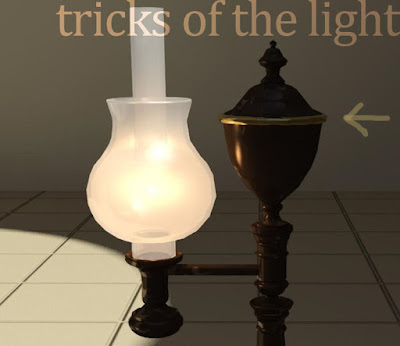 Should I model the little levers and knobs that allow the lamp to function ? They are there on the current replicas (let's stop calling them fakes) but probably don't actually do anything. Why would they, on an electric light fitting? Actually this is an Argand lamp, invented by a Swiss contemporary of Soane who came to England, met up with Boulton & Watt of steam engine fame, and had them manufactured in Birmingham. This was cutting edge technology, and Soane was lapping it up. There is a slightly different one, still sitting in the study of his museum/house. You can see the little wheel for adjusting the wick. Argand's insight was to make a cylindrical wick and have air pass through it from below, drawn up by the chimney effect caused be a glass cylinder above. The result was a much brighter flame, more efficient burning of the oil. 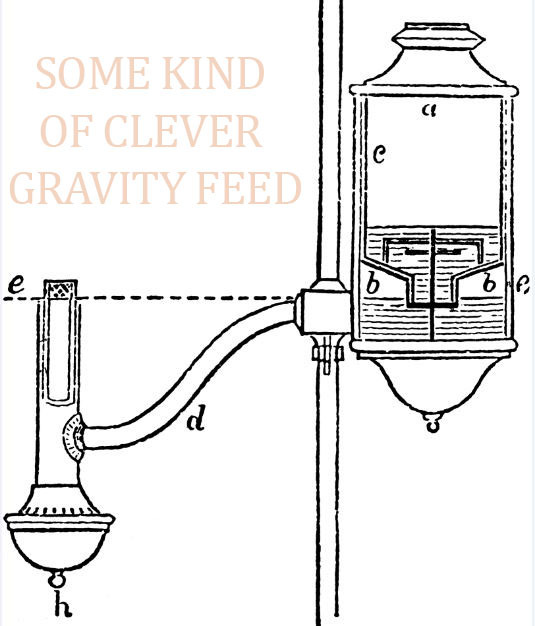 I found a diagram of the gravity feed mechanism, but I still don't fully understand it. Something to do with atmospheric pressure and vacuums I suppose. I'm struggling hard to imagine the world that Soane inhabited: fascinated by ancient history, in thrall to classicism, but studying it all through the lens of scientific enquiry, analysing and measuring. And all around him things are changing. Suddenly you can work at night in a much clearer light: drawing, writing letters, studying your specimens while outside the London fog swirls around the lamplighters busy adjusting the new fangled street lights paid for by the joint contributions of all the property owners of Lincolns Inn Fields. So I added more golden rings, tweaked the luminance, fiddled with the background, placed a second lamp and adjusted the composition of my image. 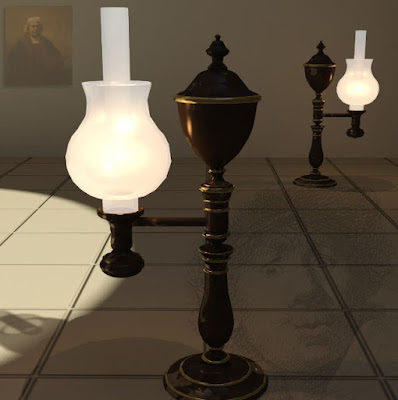 Chiairoscuro, shades of Rembrandt perhaps, allusions and illusions of the unconscious mind. 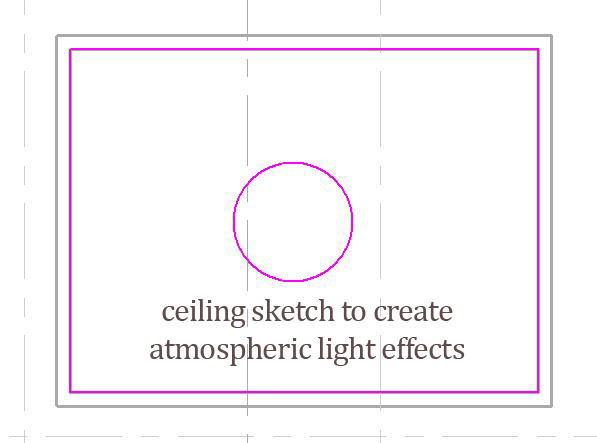 Or does a diagrammatic approach better represent my thinking processes here? Hand-drawn notes and arrows, more cubist collage than baroque theatrics ... 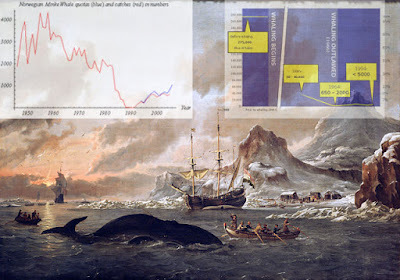 But spare a thought for the whales, whose numbers were decimated by Argand's creativity and Soane's enthusiasm for new technologies to illuminate his workaholic evening labours.